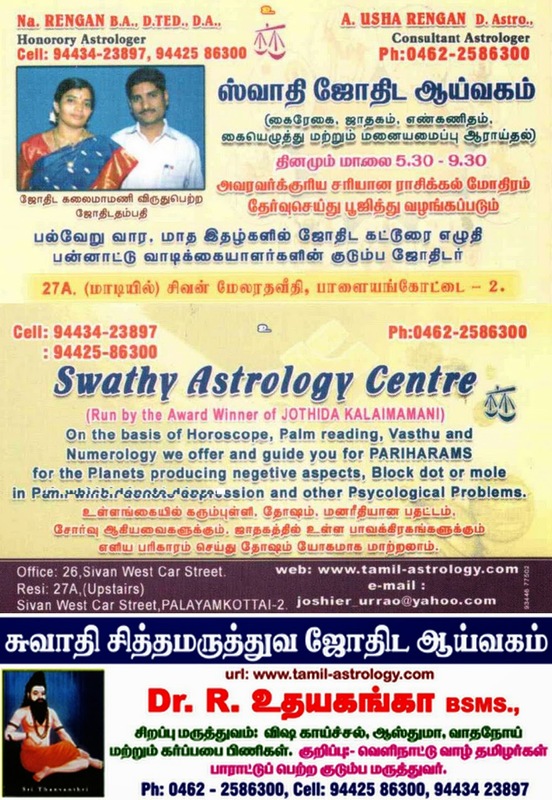 Welcome to "Swathi Jothida Aiyvagam" for advices regarding Astrology, Numerology, Palmistry and Vaasthu. ஜோதிடம், கைரேகை சாஸ்திரம், எண் கணிதம், வாஸ்துசாஸ்திரம் மூலம் வருங்காலம் அறிய "ஸ்வாதி ஜோதிட ஆய்வகம்" உங்களை அன்புடன் வரவேற்கிறது. They are also appreciated in local print and electronic media. THEN THE MOUNTS ARE, FROM THUMB TO CLOCKWISE: UNDER THUMB: MOUNT OF VENUS, UNDER FOURTH FINGER: MOUNT OF JUPITER, UNDER THIRD FINGER - THE MOUNT OF SATURN, UNDER SECOND FINGER - MOUNT OF SUN, UNDER FIRST FINGER - THE MOUNT OF MERCURY, THEN LOWER BELOW THE FIRST FINGER THAT IS OPPOSITE SIDE TO VENUS MOUNT IS CALLED MOUNT OF MOON. IN PALM READING WE SAW THE LINE AND MOUNTS AND IT IS CALCULATED AND CORELATE ACCORDING TO THEIR AGE, WORKING CONDITION, ECONOMIC SITUATION, TYPE OF FAMILY AND CHILDREN THEN ONLY WE GIVE SUGGESTTION TO EVERY ONE FOR THEIR IMPROVE THROUGH PREDICT THEIR HOROSCOPES ALSO. IN PALM READING THE PROCESS GIVES VERY GOOD RESULT TO EDUCATED AND NORMAL EDUCATED PEOPLES ALSO. THOSE WHO ARE BELOW NORMAL IN ALL ASPECTS LIKE, HEALTH, EDUCATION, JOB, MARRIAGE ETC., WE MAY FOUND THROUGH THEIR PALM AND GIVE THE SUGGESTION FOR PARIHARA LIKE "KARYA SITHI"